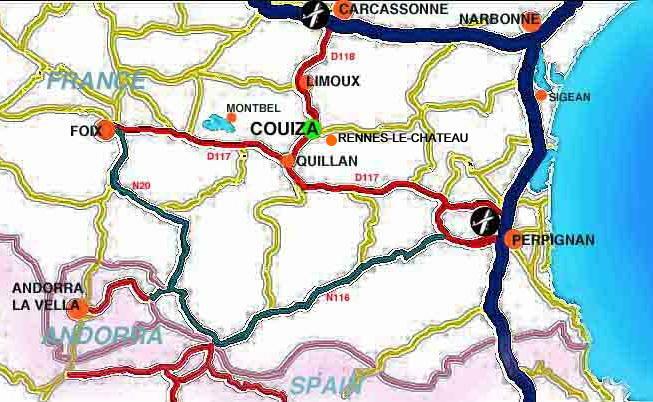 The nearest airports to Couiza are Carcassonne (34 km), Perpignan (60 km) and Toulouse (100 km). The chart below shows details of some of the flights to these airports and also Montpellier and Barcelona airports. To find out specific flight details, click on one of the flight companies. London Stansted, Birmingham, Bristol, Southampton, Manchester, etc. Gatwick, Paris, East Midlands, Cardiff, etc. If you're travelling to Carcassonne airport, we recommend the aerobus service, which goes straight from the airport to Couiza, stopping one minute from the holiday gite. If you're looking for car hire, we recommend Auto Europe Car Hire which is an English speaking firm who guarantee to offer the best prices, do not charge for cancellations and have outlets in Carcassonne, Perpignan and Toulouse, plus many other locations in France. The map of Languedoc-Roussillon below is interactive, so to find out about the area around Couiza, please click on the relevant area to view a related site and information about holiday activities.